Since our earliest ancestors first roamed the earth approximately 7 million years ago, we have been here. After discovering fire approximately 1.9 million years ago we began our dominance of the planet. But when we look at the artifacts and archaeology of our ancient ancestors we are only going back maybe 10-20 thousand years. This is a drop in the sea compared to the millions of years we have been here! Millions…. that’s hard to fathom or even put into context. The point I am making here is that we, as a species, have been here living with the other animals and plants, co-existing with the life forms that exist on this planet for millions of years. Not as something separate. We didn't just show up here. We all evolved here, all plants, animals, and humans originated from single cell life forms that lived in the primordial ooze. So what is nature? Aren't ALL the plants, animals and life forms that live on this planet nature? Yes. 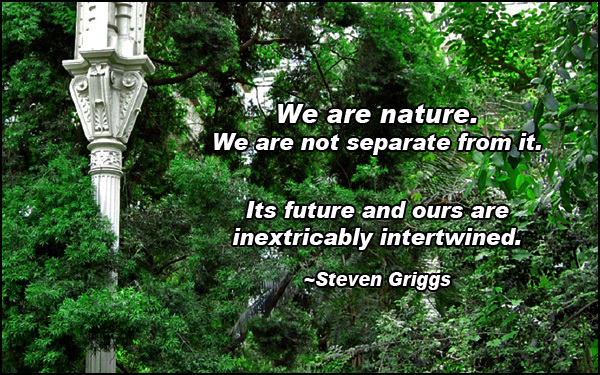 We are nature. We are not separate from it. Yes, we have put our stamp on the planet and tried our best to modify it and bend it to our will, as only humans do. But it has only been a short time, relatively speaking, since we lost our intimacy and direct connection with the ecosystem. Over time we have become more and more separated and insulated from our connection with the planet. We began to live in tight, protected structures, spending time driving in machines, or flying in machines across the planet, eating food that no longer has any obvious connection to its source. Insulated from everything. We have become separated from the planet. A part of this disconnection I think has come from a collective push by our culture over the past twenty or thirty years to look at nature as if it was something apart from us, something separate. Almost like it is something to worship, like it was our mother….. Remember the commercials- “It’s not nice to fool Mother Nature…”? We are the naughty children abusing the earth, creating global warming, pollution, wasting the resources of this planet by killing the animals and depleting the oceans. We are terribly efficient at killing, extracting, processing and utilizing the bounty of this planet. But we are not separate from it. Its future and ours are inextricably intertwined. We will not control it. Thinking we can always modify and control nature is an example of the arrogance of man. In another few hundred thousand years, the planet will have evolved again. It will be what it will be and we may not be a part of that evolution….. But whatever it is, we can’t control it. So in the meantime, instead of feeling separate or apart from “Nature”, try to look at everything in a more inclusive way, try to affirm your connection to all things on this planet. The next time you are out for a walk or hike or when you are camping in the woods, pay more attention. Look for the feelings that may pop up. As you walk into the woods or wherever you are outdoors, sometimes doesn't it feel just a little bit like…..home? Doesn't the smell of wood smoke make you feel good….. and safe? Doesn't the feeling you get sitting around the campfire with your friends and family feel good….. and right? The memories of millions of years of living naturally, outside in small groups, around open fires don't go away in a few thousand years. And that’s who we really are.